The contributors to Explorations in Self Psychology, volume 19 of the Progress in Self Psychology series, wrestle with two interrelated questions at the nexus of contemporary discussions of technique: How "authentic" and relationally invested should the self psychologically informed analyst be, and what role should self-disclosure play in the treatment process? The responses to these questions embrace the full range of clinical possibilities. Dudley and Walker argue that empathically based interpretation precludes self-disclosure whereas Miller argues in favor of authentic self-expression and against the self psychologist's frustrating attempt to "decenter" from frustration or anger. Consideration of the utility of a consistently empathic stance continues with Weisel-Barth's clinical presentation and the discussions that it elicits about management of her patient's primary destructiveness. Lenoff's critical rereading of Kohut's "Examination of the Relationship Between Mode of Observation and Theory" and Rieveschl & Cowan's "Selfhood and the Dance of Empathy" deepen still further a contemporary perspective on the nature (and advisability) of a consistently empathic stance in the face of interactive and enactive treatment challenges. 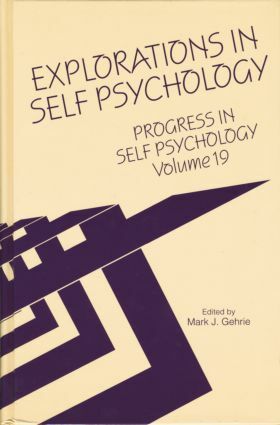 Other timely self-psychological explorations examine the twinship selfobject experience and homosexuality; self-psychological work with adolescents; and Neville Symington's theory of narcissism. Contributions to applied analysis explore topics as diverse as an exchange of dreams between John Adams and Benjamin Rush; Mann's Death in Venice; the films of Ingmar Bergman; psychotherapy of the elderly; and disabilities in the sensory-motor integration in children. And Volume 19 concludes with Constance Goldberg's candid and enlightening reminiscence of Heinz Kohut, "a very complex man with whom to be in a relationship." Part I: Theory. Dudley, Walker, "To Be or Not To Be? ": The Question of Authenticity, Therapist Subjectivity, and the Role of Interpretive Moments in Treatment. Lenoff, Consequences of "Empathy": Rereading Kohut's (1959) "Examination of the Relationship Between Mode of Observation and Theory." Martinez, Twinship Selfobject Experience and Homosexuality. Miller, Empathy and Self Expression: Confessions of a Sometimes Angry Self Psychologist. Ornstein, Survival and Recovery: Psychoanalytic Reflections. Rieveschl, Cowan, Selfhood and the Dance of Empathy. Shoshani, Shoshani, Psychic Survival versus Psychic Freedom: Reflections on Symington's Theory of Narcissism. Part II: Clinical. Smaller, Working with Adolescents: A Time for "Reconsideration." Stern, A Case of Sexual (Dis-)Orientation with Thoughts on Sexuality, Sexual Orientation, and Psychoanalysis. Shane, Wiesel-Barth, Aron, & Stolorow, Panel: The Role of the Relationship in the Therapeutic Process. Part III: Applied. Childs, Death in Venice: A Selfobject Perspective on Thomas Mann's Homolimerence. Elson, John Adams and Benjamin Rush Exchange Dreams. Rass, Making Contact with the Perception World of a Child: Undetected Disabilities in Sensory Motor Integration and the Effects on the Development of Self-Esteem. Schulz, Tragic Man and Narcissistic Disturbance in the Films of Ingmar Bergman. Wada, The Applicability of Self Psychology to Psychotherapy with the Elderly: With Emphasis on Twinship Selfobject Needs and Empathy as a Mode of Observation. Part IV: Personal Memoir. Goldberg, A Personal and Professional Reminiscence of Heinz Kohut. Mark J Gehrie, Ph.D., is Faculty, Training and Supervising Analyst at the Chicago Institue for Psychoanalysis. He is the coeditor, with John Gedo, of Impasse and Innovation in Psychoanalysis: Clinical Case Seminars (TAP, 1993) and author of numerous articles.